I recently wrote about Augmented Reality and gave 5 examples of Augmented Reality being used in advertising. Even more advertisers are now using Augmented Reality in their campaigns, so here are 5 more examples! 1) Papa John's pizza add Augmented Reality to pizza boxes! Papa John's are now allowing users to hold their pizza box up to their webcam for an Augmented Reality experience. Internet users have the chance to take a 'virtual road trip', using Augmented Reality to drive the Papa John's original Camaro and picking up exclusive offers along the way. 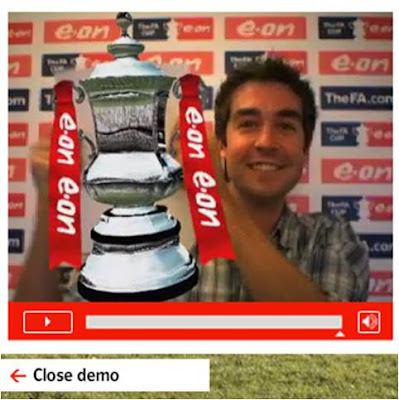 Through the site www.familyfootball.co.uk FA Cup sponsor E.ON have created the opportunity for fans to use Augmented Reality to lift the FA Cup. There is also a demo to show how it works for the uninitiated! E.ON - lift the Augmented Reality FA Cup! The latest campaign for Doritos in Brazil offers internet users the chance to hold their Doritos packet up to their webcam and see the Doritos characters come to life. 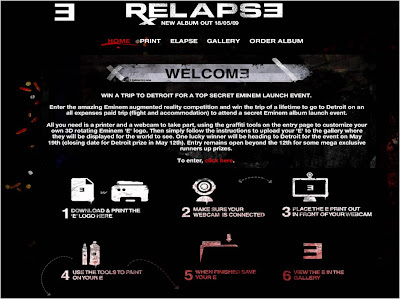 To promote the launch of the Eminem 'Relapse' album, Augmented Reality has been used as the backbone to a win a trip to Detroit for 'a secret Eminem album launch event' competition. Internet users print off a logo, hold it up to their webcam, customise an on-screen 3D logo using virtual 'graffiti tools' and then enter their effort into the competition. Nissan have personalised Augmented Reality through their Nissan Good Decision website. Visitors are asked 5 questions and given options on each one (colour, interest, type of car etc). 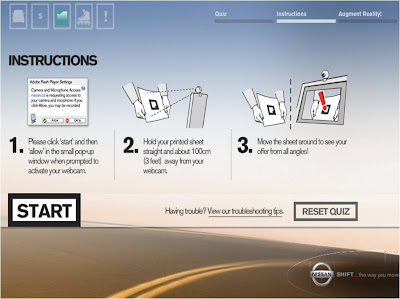 At the end of the 'Good Decision' quiz, users print out their 'Good Decision certificate', hold it up to the webcam and then have a personalised Augmented Reality Nissan experience. Augmented Reality has been covered by the Wall Street Journal and even though some like Ad Lab are arguing that 'Augmented Reality is the new Second Life', there is no doubting that Augmented Reality executions are becoming more popular - they seem to have exploded in number over the last few weeks. It takes a fair amount of effort for users to participate (printing and using webcams) but the experience created is unique and engaging. Whilst the number of webcams is increasing, the ability for Augmented Reality to scale may be driven by the creative itself. As Augmented Reality executions become more prevalent, then the need to incentivise users to participate will increase. To this extent I really like the Papa John's execution where they are encouraging users to keep coming back by announcing that the experience will keep changing, whilst rewarding participation by offering exclusive coupons and discounts - a format for others to follow!